Mail4Rosey: FabKids Would Be a Great Gift Subscription Idea! Disclosure: I received an outfit to help facilitate the subscription review. All opinions stated are genuine and my own. Yesterday I told my youngest to suit up we were going out. He put on his new FabKids outfit, and we were off! FabKids is a monthly subscription service, with no obligation to buy, for children's clothing. Founded in part by famous actress, Christina Applegate, the clothing line is cool, funky, and fresh. ;) It's also high quality and holds up, wash after wash. With Christmas on the way, I have to say: If you're looking for a useful and fun gift idea, won't you consider a FabKids subscription? How fun would it be to know you were giving someone a new outfit each and every month? The subscription service itself work very easily. You take a quiz when you sign up, to help match outfits to your tastes and needs. That being said, you are free to purchase as little or as much as you want, or nothing at all. Each month you will be charged the price of one outfit, which means you will have one credit on your account to purchase an outfit of choice. You can make the purchase whenever you want to, but it's paid for on a certain day each month, unless you note that you do not want to be charged for the month. Easy peasy, lemon squeezy. 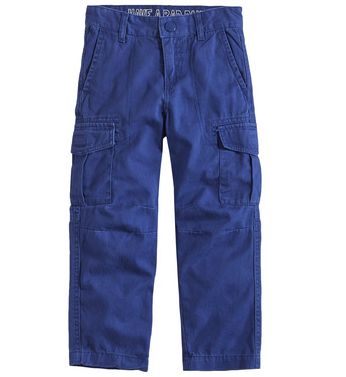 The Classic Cargo Pants are the perfect match in color, very durable, and they have the classic roomy cargo pant pockets on each leg and on the rear end. So...for our big day out, I let my son pick where we were going to go, and what we were going to do. He picked the toy section at the store, with a short stop off at sports (it's too cold to play sports outside right now though). Then we moseyed on over to his predictable office supplies stop (I've written about it before, he loves to browse through office supplies), and then to get a doughnut (which he'll have today after school). You can see the whole outfit here. FabKids has both girls and boys clothing items (right now they've got some of the cutest girls' boots I've seen! ), and they often have terrific sales going on. Today, for instance, they are offering 20% off your first outfit or item, so it's a great time to give them a try! You can learn more about Fabkids by visiting their website. You can also follow them on Facebook, Pinterest, and/or Twitter. I love FabKids. They have so many cute things there. Your son is adorable! I love those cargo pants - great color! You can't beat a good pair of cargo pants. I agree. Her son is a handsome little man. They have great stuff. Cute pics! These look like cute items. Your son is adorable! I love Fabkids especially for boys! 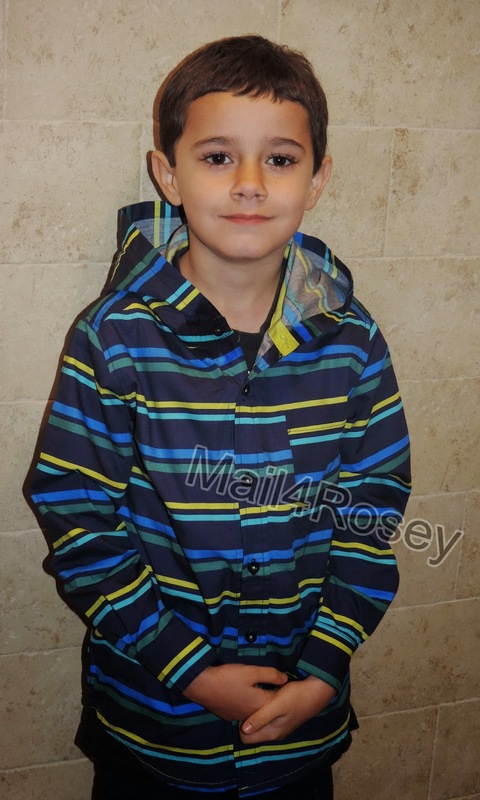 It is not fun shopping for boy's clothes but this company provides great selections. I can see having given FabKids subscriptions as a gift to my nieces or nephew when they were younger. They have such cute clothes. What a handsome guy. I love the cargo pants. The hoodie is awesome. I need to try this for my toddler. What a great idea. Really great idea and with young couples a new outfit for their young one is a real gift that keeps on giving. Love this. Your son looks adorable! I never heard of FabKids but it seems totally fab! Aww look at your little guy, he's so stinking adorable. Thanks for sharing the info about Fab Kids. I've got to finish up Christmas. He's adorable! And that sweater is spiffy! What a cool idea! I've heard some great things about FabKids! He looks great in his clothes. It's definitely a great idea to have a clothing subscription, takes shopping for clothes off the list of to do list! Fabkids has some really cute clothes. He looks so handsome in them. They have such a wide selection for children. Do they have big kids sizes too? He always looks so cool in his outfits. We haven't been able to go out and take pics in ours as yet because of this horrible snow weather we've been having but I just love FAB KIDS!! What a handsome little dude. He's got some major swagger going on. Thanks for sharing. This would make a great gift idea. Cute kid! I have been meaning to look into this! Thanks for the info, I will look into it further! With my two boys growing like they do, this would be great! What an awesome day you two had together! Hurray for office supplies, donuts, milkshakes, and cute clothes! They have really stylish outfits for kids. Plus they match really well. I love that outfit! I really need to try FabKids for my son. Omg your son is wayyyy to adorable!!! And that outfit!!!! Love itttt!!! So cute and perfect for my boys. Thanks i'll head on over and check what all they have to offer. He is really styling! Looks great and the style is just perfect for little guys. My son would love these clothes especially those cargo pants. I need to check out Fabkids. Wow that's great! The clothes look great and with boys, you really can't go wrong. Mine like most everything when it comes to clothes. Looks like awesome stuff to me!! I haven't tried FabKids, but will definitely give them a look. I know my boys love to get new things to wear. sounds like a good service and I look the look of that hoody, it suits your boy to the T.
This sounds like a great service. The top your little one is wearing is really lovely. Your little man is such a handsome fella! Love that outfit. It would make a great gift. I bet my daughter would enjoy this and could really use it. What a great idea! I think its nice that there are now companies like this for kids as well- I know of the ones for adults and they seem great! This is such a cute idea especially for busy moms! Times sure have changed since my kids were little that's for sure. I really like the idea behind the Fabkids site. Helps parents shopping for their kids. Plus the kids clothing are very stylish. Fab Kids' going to appear on my Christmas list. He's so cute! And I love that jacket! Unique! I haven't heard of FabKids before, but it sounds like a great service. My daughter hates to try on new clothes when shopping, so it would be great to have different clothes delivered to our house and try them on at home. This sounds so awesome! Wish they had one in SA but will suggest it to my friends, thanks for sharing! I love their clothing. My girls love FabKids! Your son is a cutie! Fabkids always has some seriously cute outfits!!! WE used to do Fabkids for my daughter! It was awesome! Handsome little man you got there. I'll have to check them out. My kids are too old for Fabkids but I have a niece and SIL who would adore this service. Love the pics of your little guy. That is a pretty cool idea that Christina Applegate came up with for parents to shop for their kids online. Your son definitely doesn't seem camera shy! FabKids has so many great pieces. I love being able to shop online. I will have to check FabKids out! Thank you for sharing. Thank you for introducing me to this fun company. The clothes look bright and colorful. I've never heard of FabKids before. He looks adorable in that outfit. This would be awesome for my girls if they weren't so much older. I wish they had teen clothes. This sounds like a great service! Sounds like you had a wonderful day! What a cutie! My 4 yr old would love to receive a monthly package in the mail with new clothes. Definitely checking this out. Oh! I didn't know they finally added boy selections. I'll have to check that out. I've bought it for my daughter in the past. So handsome! I love the colors in that shirt. He looks so handsome. He's going to have a lot of girls after him in no time. He is SO CUTE!!! You are going to have your hands full when he is older! Your handsome boy wears the brands well. I think a subscription would be nice if it was doable. that's so cool! i had no idea they had these types of services for kids. i just learned about stitch fix not too long ago. I've been looking into FabKids and the other Fabs (women's and athletes), it seems like such a good deal, especially the kids since they grow so quickly. The way I read it, is you subscribe for 29 a month and if you don't use the 29 on month it just rolls over to the next month - is that right? If you don't want to be charged, you have to say no thank you for the month, by the date given. I've never tried subscriptions like this one. But it sounds like a good idea. Looks like they've got nice clothes too. I have heard of this before. It is actually an interesting and unique way to go for kids clothes. I love Fabkids. I don't have a kid yet, but i got recently a gif card for my friend who has 3 girls. They loved it. Never heard of them. Looks like nice clothing though. Love what your son is wearing! I've done JustFab and Fabletics before, and loved them. Fabkids looks just as awesome! That hoodie looks awesome on your son! FabKids has some great clothes. I have heard of them, but didn't realize that they had such cute clothing! I'll definitely have to check them out sometime. FabKids is such a great idea for kids. I wish they would have been around when my girls were younger. I really like the hoody type and also a jeans, this kind of outfit i should try for my son. Thanks for that. Do they have toddler outfits? I only have my nephew to dress who is only 10 weeks now. This sounds like a great subscription box indeed. It is great for the to get a new outfit every month during the school year. Now I wish there's fab kids subscription here.